August 16,2016 (San Diego’s East County)—The deadline for candidates to file, submit signatures and run for local offices has been extended to 5 p.m. tomorrow in races where incumbents did not file ot seek reelection. This includes key city council and mayor races in East County, as well as many school boards and special districts such as fire and water boards,as well as community planning boards. 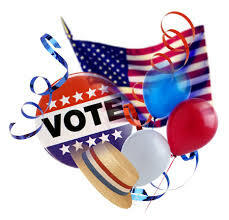 August 7, 2014 (San Diego's East County) -- Tomorrow, August 8 at 5 p.m. is the deadline to file for running for most local offices in East County--though if an incumbent opts not to file for reelection, that deadline can be extended for several more days. Alpine's Community Planning Group has just 5 candidates so for to fill 7 seats. These are just two examples of a race where the balance of power could shift--or not--depending on which candidates if any step forward to run. Local seats on the November ballot include school boards, planning groups, water boards, fire boards, mayor and city councils across East County. Currently a numberof these positions have no candidates filed to run, or only one candidate, leaving voters without a choice. November 9, 2012 (San Diego) –Some of the biggest winners and losers in this election weren’t candidates—though they’ll clearly be feeling the impacts of the election outcomes. July 14, 2012 (San Diego’s East County) – Want to run for office? There are many seats open for local candidates, from planning groups to school boards and city councils.